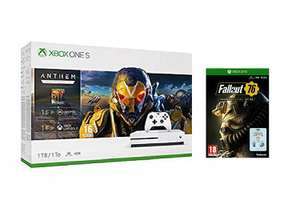 Alternatively, add a copy of Crackdown 3 and pay £219.99. The Anthem Legion of Dawn edition includes four legendary armour packs, a legendary weapon, and more. Join up to three other players to explore a beautiful and deadly world or assemble your own individual exosuit with unique technology and artefacts. The edition, in addition to Fallout 76 game, consists of a set of three pin badges from the Fallout S.P.E.C.I.A.L attribute range, the ruleset that powers all Fallout games and an acronym standing for the primary statistics in the system: Strength, Perception, Endurance, Charisma, Intelligence, Agility and Luck. This edition features the Strength, Charisma & Luck attributes. Worth it just for Fallout 76! It's a decent deal to be sure, just a shame the games aren't that great. Gamepass makes up for it though.